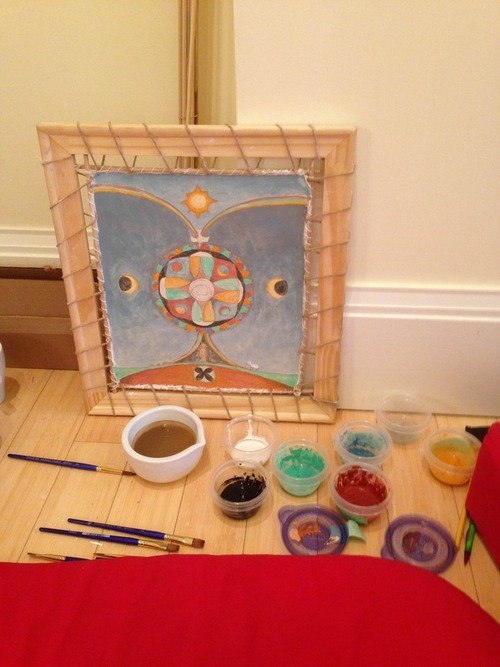 Lessons from the best painting class ever, Creating Your Inner Mandala with Kalsang Dawa at the Berkeley Shambhala Center. The four day workshop was filled with grinding paints, preparation of canvas, composition, and painting. We learned the traditional methods of preparation and expressed our own creativity by painting our own personal mandala. Kalsang began the class by saying, “We’re going to have fun, we’ll grind rocks into paint for the next two days, hand stretch our canvases, finally paint, and it will all be fun.” He didn’t say it as a command, rather as an invitation and matter of fact. And we did have fun. Of course there was some apprehension about grinding stones for two days to make the paint. But rather than than a monotonous tasks, it was a means to connect with the paint and colors. We’d simply talk about life in the way you talk to your friends on a porch during summer vacation, rather than in a meeting or on the bus. Occasionally, he’d tell stories of painting or about the spiritual qualities of the paint. Human expression is naturally joyful. Kalsang once said, “The natural state of the body is to be healthy,” which is common sense, but was said with complete faith and knowledge that is rare and true. We just need to connect back with that natural health to become healthy. Likewise, human expression is joyful, so we just need to be who we are to experience it. Art doesn’t begin when you sit down to make a beautiful painting, nor does it end there. Art begins in the preparation of space and working with materials. I’ve been to a number of art classes, in which you’re handed paints and brushes and told to paint the vases in front of you. In my experience, in life, ikebana, and this class, art never begins there. Art begins by creating a space where art can happen. 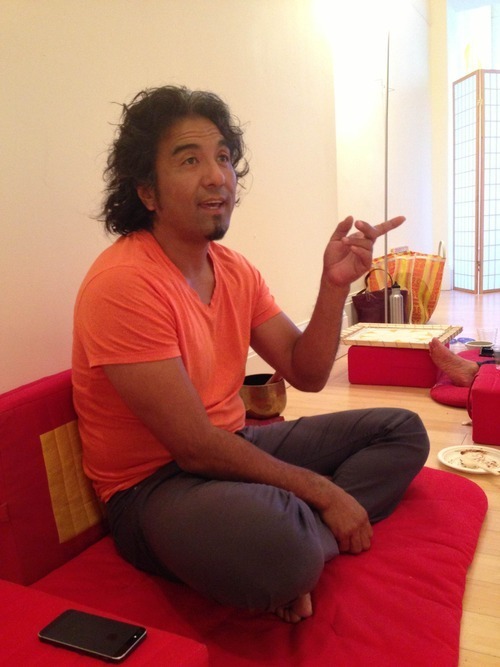 Our days began with meditation. Our art-making started by preparing canvases and paint by hand. The art isn’t really what you do with that space or paint, its how you relate to it. All material is informed by its history. We have a chance to imbue our materials with mindfulness and prayers. “Do not look around and judge yourself by others and, least of all, do not judge yourself. Not every brush stroke will be pretty, rather you build it up slowly,” Kalsang would say at the start of every session. When you judge your art in the making of it, you’re holding an expectation for it. When you compare your work with others, you’re holding another expectation. The problem is that expectation limits creativity. If you’re an incredibly skilled artist, the best you can do is manifest your conceptual expectation. When you don’t judge or hold expectation, you’re inviting the depth of your spirit to express itself freely. This is when art happens. Even before beginning, Kalsang made us promise we’d finish our paintings no matter what. This commitment is a standard maxim in contemplative art. Art is a journey and a process, so when you quit before its done, you’re actually judging the unfinished work according to conceptual standards. You say you’ve lost faith in the original creative energies that formed your being and are expressing themselves. You’re saying you know better than the universe, as manifest in your heart and its expression. Working with this creativity is just like being in a relationship, if you said “I know better than you,” to your partner, you might expect some fall out. Finishing your work is showing respect for it and where it comes from, which is ultimately your self. Everyone I’ve met has a trauma around art making in classes, particularly art students. Some students in the class said, “Art school is where I learned never to paint again.” We hold strange notions about art, which cause us to egotistically identify with our art and cause weak teachers to criticize and not support. Even though I never went through art school, I deal with this pattern every day in my art making. When you hold art in a contemplative way, you can’t do it wrong. Everything you do is an expression of the deep seed of creativity in your heart, thus its a discover of self rather than a product of conceptual mind. It heals, encourages, and supports just like any other deep work that connects you with your higher self. It took one day for the canvas, one and a half to grind the paint, and two days to work on the composition and painting, and we still didn’t finish. 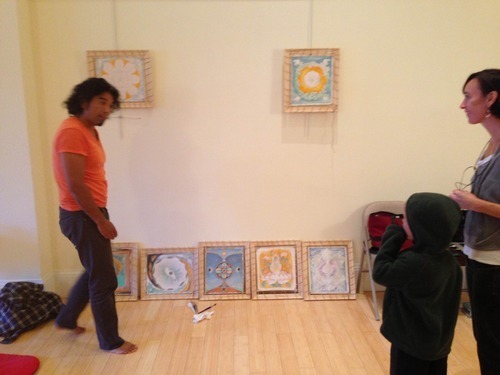 Kalsang spends months on his thangkas and said that everyday he comes up against expectation and judgement and has to come back a state of openness to the work. The good news is that time passes anyways. By focusing on the step at hand, not on anticipations of the future, you’re present with the work. You can think about what you’re doing. All your creative energies can come into the present moment and not get wasted on your thoughts about what will happen. 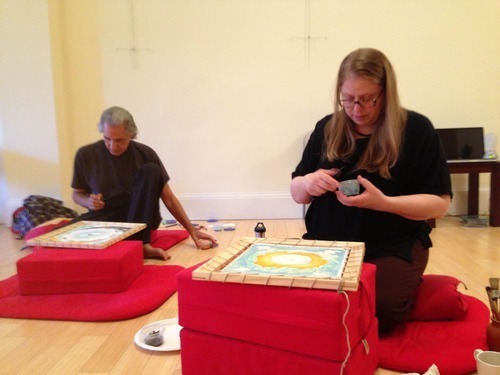 When you drop into the present moment with art, you can really feel its step-by-step nature. You’ll feel that composition comes before painting, or that this color wants to be laid down before that color. You’ll find that you don’t have to worry about it because the art work itself will show the path. This point is close to my heart. I used to think of an artist as a lone visionary, expanding consciousness in order to gain a vision worth expressing, and encoding it in paint in order to communicate the grand sentiment. Kalsang would say, “When you paint the Buddha, you’re painting yourself.” When he paints a Buddhist deity, he tries to become that deity because they’re really just aspects of self. A good painting connects you with your highest potential. It’s not like reading a letter enveloped in paint, its like looking in a mirror. Art is something that happens in the here and now in our world, which is full of matter, emotion, and soul. I often think of a good artist as a supreme manipulator, someone who can express his vision in the physical world no matter what purity and strength of will. Accordingly, paint is just a tool to communicate this vision. It is dead matter that achieves life only through the will of the artist, as if he is some god breathing life into the pigment dust. As we ground the paint, Kalsang would share the story of our colors. He’d tell us about the spiritual and social histories of the colors, like yellow was worn by peasants, or the Western Europe had a love affair with red. He’d tell us about the stones, like how the red pipe stone we ground was used by the Native Americans. Everything is living, so the paint you use is a collaborator rather than a tool. That’s why we learned to respect and connect with it. You’d never command your friend to help you without respect, but I do it frequently when I squeeze out a daub of paint from a tube without even acknowledging it as a vital energy. My time working with the pigment showed me that art can be like two things. First, it could be like working in a factory by yourself, surrounded by dead tools. Or it can be like playing a fun game with friends. My mandala with the hand ground pigments. It doesn’t matter if you make a living from art, haven’t touched it since your traumatic art school days, or never made art before, you’re an artist. It doesn’t matter if you never make a painting, sculpture, or poem, you’re living in this world, so you’re an artist. We all have a heart of creativity that yearns for expression and engagement with the world. Art is not what we make, its how we live. Re-posted with permission from Daniel Rekshan’s Blog.